When I visited Nimes a year and a half ago, I’d started looking round at other places in Southern France that might be worth a look. There are loads, representing a whole range of Roman sites; industrial, commercial, ritual, residential. So much to see, but I have to start somewhere so, taking advantage of my new-found (but, alas, only temporary) freedom, I decided to pay a visit to Marseille. 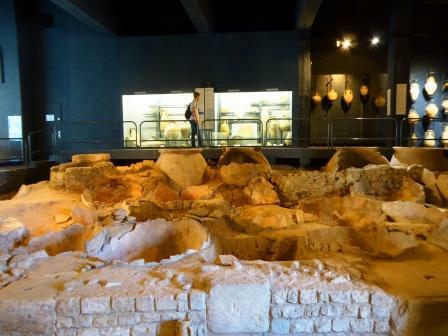 Marseille, ancient Massilia, or Massalia, was founded by settlers from the Ionian Greek colony of Phocea (in modern western Turkey) in about 600BCE. 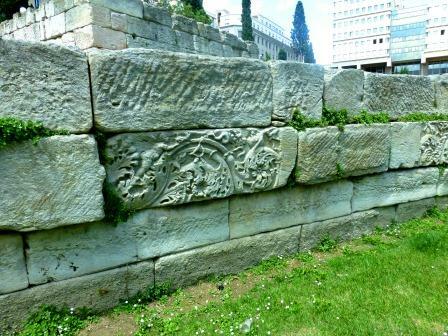 The city had a significant Greek and Phoenician history before the Romans showed up, and there is plenty of archaeological evidence for his very long ancient history. 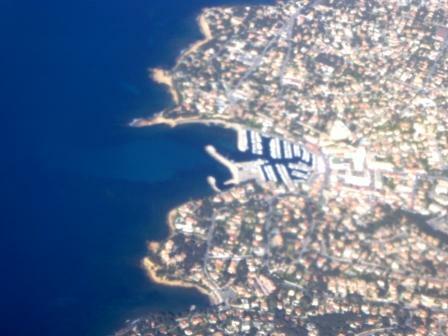 A key feature of Marseille, today as in the past, is its harbour. The line of the harbour, Vieiux Port, today has been regularised with built concrete harbour walls and quays, but the coast round here is very uneven, with lots of small inlets, islands and promontories. The ancient coastline wiggled about even more, and would have been a mass of tiny inlets, beach areas, estuaries and islands but as the city was being established the valuable anchorage in this area was being exploited and improved. 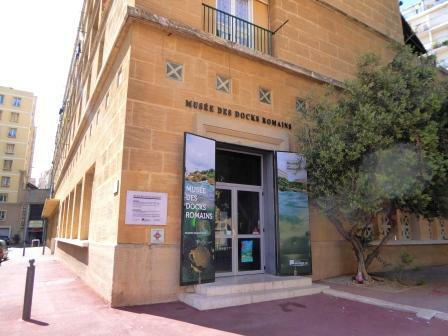 The walls of one of the docks are several hundred metres inland of the present one, in the grounds of the city’s history museum, Musee d’Histoire de Marseille. Here there are in-situ remains of part of the Flavian waterfront, docks, streets, a fresh-water storage facility and a range of buildings. The large grassed area on the right of the wall would have been ‘ Horn’ harbour basin, with barges mooring up here, and loading and unloading. 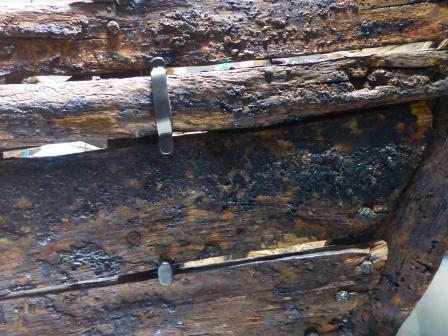 This part of the dock wall has been made from reused earlier Roman material. This harbour was subject to continual silting and was abandoned in the early third-century. 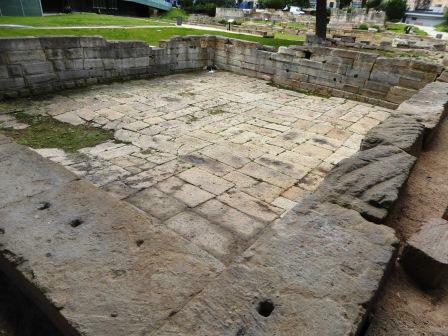 The nearby fresh-water basin was constructed with the aim of reducing the silting (from streams running into the harbour), with the fresh-water used for supplying the ships. As an important port, handling trade and transport from other areas along the southern European coast, and also from across the Mediterranean, North Africa. 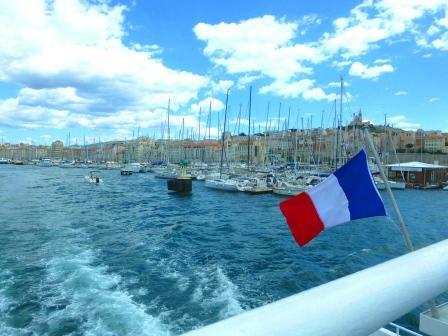 Still today, Marseille is a key port for ferries and cruise ships sailing from Algeria and Tunisia. 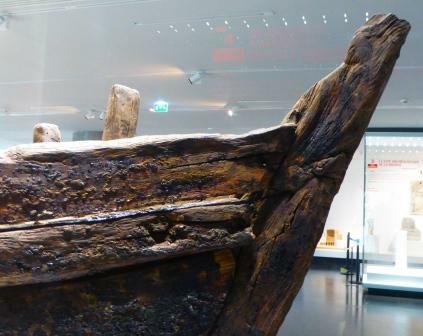 What is great to see in the city’s museums is evidence of the boats and barges that came to grief on this coast. 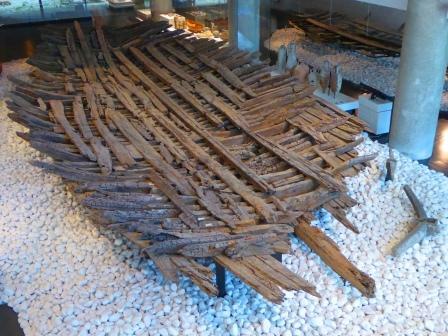 There are over 50 known shipwrecks in the bay around Marseille, and each one adds evidence to the story of the city. I’m just going to go large straight away. 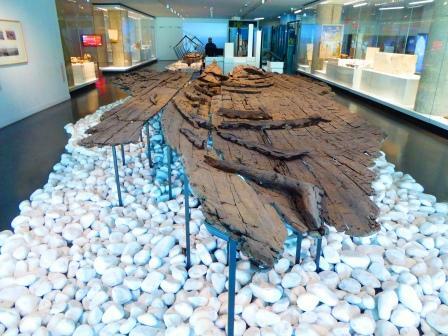 In the city museum there are the remains of several large transport barges found during excavations in the city. 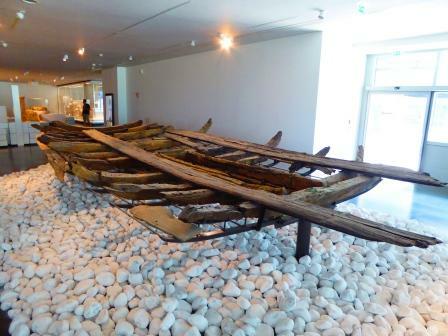 6th century BCE wooden boat. It’s possible to see the construction methods….. 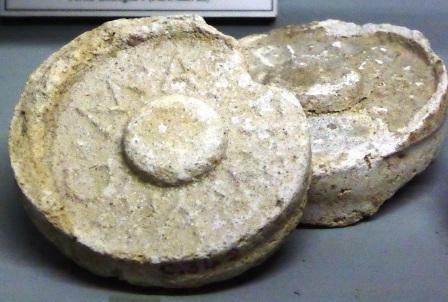 I was particularly keen to visit the Roman Docks Museum (free entry, people! 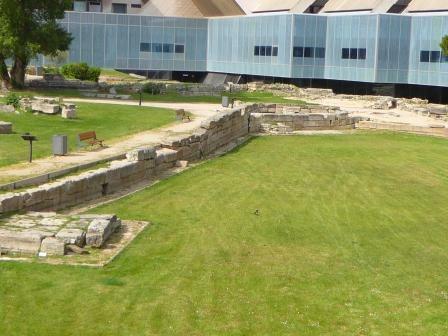 ), which has actually been built around an in-situ warehouse that stood alongside the quay for much of the Roman period. 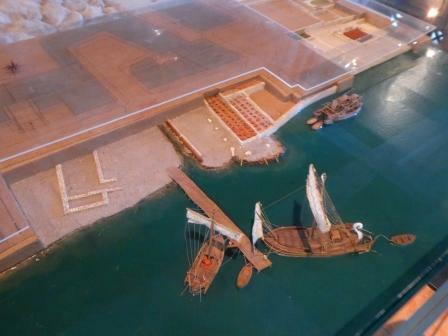 Along the Roman waterfront, goods barges would moor up and unload cargoes of goods, including commodities like wheat, salted fish garum and olive oil, and a key feature of the waterfront is the unloading and storage area. 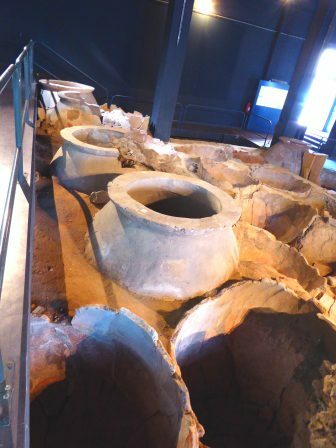 The gigantic storage pots, dolia, which were buried in the warehouse floor, are still where the Romans left them. 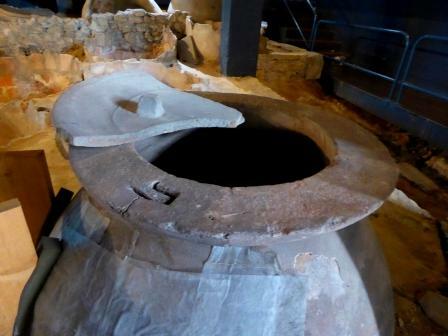 Several are intact (or reconstructed), so we can really see the massive size of these pots. This one even has part of the lid. 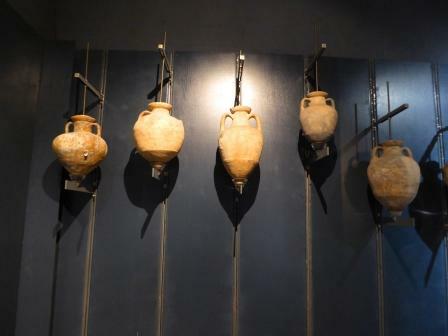 This is only a small museum space, but there are loads of artifacts associated with the trade handled by the ancient city, many of them from shipwrecks. I love this intact pot, which has a filter element at the top. 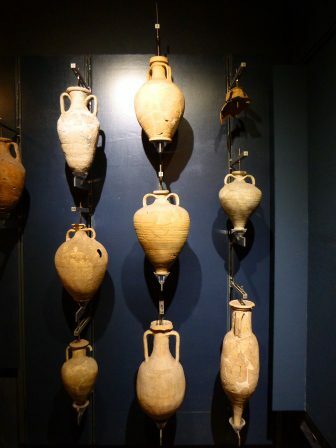 And if you’re interested in amphorae, this is a great place to see a whole range of the amphorae found in this area. 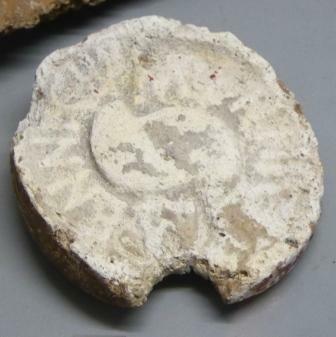 There are even some of the amphora lids, detailing the contents and traders. As I understand it, Marseille has had quite a few ups and downs and hasn’t always had the best reputation as a city. Now it really seems like it’s on an up and I was not at all disappointed with my stay there. For a Romanist, especially one interested in maritime Rome, this is an excellent place to visit. I only wish I’d been able to stay longer. 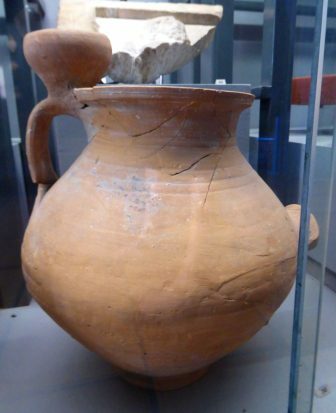 This entry was posted in Archaeology, France, Museums and Exhibitions, Romans, Uncategorized and tagged Algeria, amphorae, Archaeology, boats, docks, Gaul, Marseille, Museum Blogger, Roman, Tunisia. Bookmark the permalink.